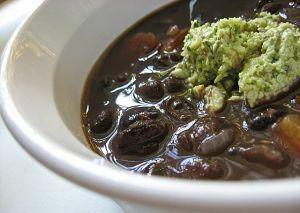 Potted Beans is a Venezuelan food recipe called Frijoles de Olla. Rinse the beans and cover them with the hot water. Add the onion and lard and bring to a boil. 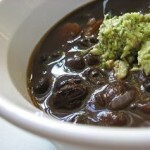 As soon as the beans come to a boil, lower the flame and let them barely simmer in crock pot, covered, for about 3 hours for black beans and 2-1/2 hours for the other varieties, or until they are tender, but not soft. Do not stir during this time. Add the salt and epazote, if you are using it, and simmer for another 30 minutes. Set aside, preferably until the next day. There should be plenty of soupy liquid.